Basic wiring is easy to understand once you have a good overall look at the system that gets the power from the utility supply lines, through the transformer, and into your home to power our modern conveniences that we have become so accustomed to. The most basic wiring system found in the home is the circuits that feed the outlets such as receptacles, switches, and lights. When we have a grasp of the entire system, it makes all of the basic wiring principles within the home much less mysterious and intimidating. The first and most important thing to consider when working with electricity is your personal safety, and the safety of others. Always ensure that the power is off before working on any basic wiring system. Use a device designed to check for the presence of voltage such as a digital voltmeter, a neon tester, a plug tester, or any suitable method to confirm that the power is off. 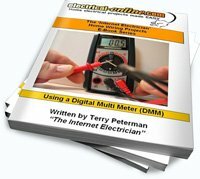 The best source on the Internet for information on basic wiring is available at www.electrical-online.com My website has an extensive amount of information on basic wiring for the DIYer with many articles and posts, including a comprehensive resource in the form of an e-book and/or a DVD entitled “The Basics of Household Wiring”. The Basics of Household Wiring – Extended Edition is a detailed training program for basic wiring, designed to teach you basic wiring procedures in a clear, effective way. This DVD and e-book are the only electrical basic wiring tutorial of its kind that takes challenging electrical basic wiring situations and makes them easy for the common person to understand. It begins by getting you familiar with the home’s basic wiring, and then you’ll advance into learning the secrets of the professionals. Never before has a training program been available in one full-length DVD and/or e-book. This entry was posted in Electrical Wiring and tagged basic wiring, circuits, electrical, electrical system, electricity, home electrical wiring, household wiring, wiring. Bookmark the permalink.